EDIT: Jan Marini has graciously offered to give away one of these amazing body scrubs to one of you. Leave a comment and tell me why you want this fabulous product by 12 midnight eastern standard time. I'll pick a winner and announce it tomorrow! 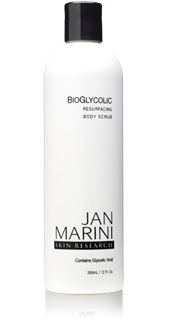 I wanted to spotlight a product that I've been using nearly everyday - Jan Marini's Bioglycolic Body Scrub. As you know, I'm a huge fan of Jan Marini and my entire skincare routine is from her line. In terms of my body, I honestly don't do much except bar soap, lotion and occasionally spf. Body scrubs have always seemed like an optional luxury for me, not making too much of a difference to use regularly. I have a few scrubs that usually sit in my shower that are only used on the random occasions that I decide to apply self-tanner. By the urging of my friend Kim at Jan Marini, I decided to try this scrub. She told me it makes your body so smooth that she hardly has to wear body lotion anymore. That claim alone made me curious. I have to use body lotion everday...it's part of my routine. If not, I'm suceptible to the dreaded ashy leg look - not cute. First off, this scrub is intended for the body, not the face. It contains the same Bioglycolic components as my facial cleanser from Jan Marini, meaning it contains resurfacing agents that not only provide moisturize to the skin, but resurface it and improve the tone and texture as well. This product is safe enough for use on a daily basis. I apply about a quarter amount to my hands at a time and rub it everywhere on my body, adding more as needed. You can also use a washcloth. Even as I'm applying the scrub, I can already feel my skin becoming more smooth. It's different than the typical scrub...the granules remove dead skin, but the ingredients also feel like they're transforming the surface into a super smooth texture. I also apply this product to my feet to take care of dry and rough patches and they are just as smooth! Afterwards, I towel off as usual and whoa! My legs look as if I've been to a spa and been scrubbed, packed and wrapped. They are super smooth, soft, and even seem to glisten. I don't ever remember my skin becoming so soft. My boyfriend has definitely noticed as well - hooray! If I wanted to, I could even skip body lotion because my skin feels uber moisturized. However, since it's an ingrained habit, I apply my regular body lotion and it absorbs so much better into my skin. This is safe for all skin types, but especially for dry skin. If you want soft, smooth, silky skin this is for you. I wish I had discovered this years before. Say goodbye to ashy legs and rough feet...my skin will never be the same. It's like I discovered the fountain of youth! I am truly not exaggerating about how much I love this product. This is a summer Must-Have. Give it a try, you want regret it. This seems like it would be super awesome in winter too. My skin gets dried out terribly in the winter, not so much in summer. i want this because im a cheap bizatch and i can save my money on lotion...then use that money on food!!! I am so glad you're doing reviews for Jan Marini Products! I was very interested to read this post... I have really, really, really dry skin and I am excited to hear that this product helped moisturize your skin to a point where you don't really need lotion. I hate wearing lotion(even though we need it) because I don't like the feeling and because it's cold. Lol! I'm weird. I would love to try this out and not have to wear lotion! Lol! oh em gee! i want this! I would love this product because it would help keep my skin moisturized. oOoo i want to try this 'cause i haven't found a good body scrub that doesn't waste lots of product (like a salt scrub) but still gets the job done. plus my body is DRYYYY! especially my legs :( i constantly use a heavy moisturizer and it still doesn't look 100% (IMO). I'd like to win this product because ever since I left MAC, and started blogging, I've been opened to a whole realm of different beauty products. I've probably only exfoliated my skin once in my life and I know there are some layers I can definately shed. LOL. Thanks for doing this..you are a makeup all-star! ooo I wanna try this out! My legs are the most dried legs ever: it takes only one time without moisturising and they get right back to the roughness.I also have extremely sensitive skin so I alway shave to be careful with the products I use. I would loveee to win it because my excema this season was horrible and left scars all over my skin. Then i started to use a new lotion by vasaline which made me break into hives! So this product would do wonders for me..I definitely need something that will keep my body moisturized even without applying massive amounts of lotion. I want to try this because I have not been using lotion and you can tell if you look at my legs. I think this would be a good product because I hear such good things about her products and I think it will good for my skin. I would love to try her product. I have never in my life had smooth skin the way you described it. Thank you for this contest. i would like to win this because i have used many other brands but nothing seems to work for me super dry and flaky skin....it would be nice to be able to get this for free and try it out....m pretty positive that Jan Marini Bioglycolic Resurfacing Body Scrub will help solve my problem! Ooh, nice review. I'm intrigued now! I would love to try this and see how it would work on me. I have really dry skin, and I forget to apply lotion all the time, so now my skin has become super dry that I need to lather vaseline on to seal in the moisture. I would love to try this! I'd love to try out this product! My skin is crazy dry and scaly right now, and it's beach weather too, so I need some help! I've heard their body scrubs were the best but have never tried them. A friend tells me that it makes her skin smooth as if she rubbed olive oil into it every day. It would be great to replace my everyday summer ritual of using body lotion with Jan Marini's Body Scrub! It would save me time, as I would be cleaning my skin and making it smooth at the same time. Thanks for your fabulous blog RenRen. Your videos are the best, and you always feature the best products. I'd love this product because I want some soft satiny skin! If it works half as good as you say, I'll rant to everyone I know to pick it up! I would love to try this scrub! I've never really used a body scrub before. I'm interested to try this product because of your rave reviews. Ill probably buy it if I don't win it. I'd love to try this product since I do have dry skin... especially my legs! lol. This'll be GREAT for the summer & winter as well. I have to have these because I want to exfoliate my uber dry legs. I had used other scrubs but to no avail. They're just too light for me. I want to have that smooth legs everybody wants to touch. Tihee. ;D Thanks for a nice review! I would absolutley love to win the Jan marini body scrub, i promise you i was at target today looking for the St Ives body scrub since my friend swore by it and (my skin is ridiculously dry inspite of all my efforts) and i couldnt find it!!!!! Me thinks, it was because i am destined to win the scrub and my guardian angels didnt want me to waste money and be disappointed :). I'm always interested in hearing about new body scrubs. I was going to try one out from Carol's Daughter but maybe I should try this one first. I'd love to try this because I'm always trying to avoid being the Ash Monster and having crocodile feet. I don't have dry skin, but I like to be moisturized. And a moisturizing body scrub can only help. i want this because my skin is AWFUL! and products dont usually work for me and i'd love to try this out because i believe it will from your review! hey ren-ren! I think this body scrub would be nice to have because my elbows are really dry, and the pigment in that skin area has gotten darker because of the lack of moisture. I live in the bay, and last week i found out that I got accepted to a college in Hawaii. I'm moving next month, and i'll be packing all my dresses, tank tops, short sleeve tops. Which means my elbows will be showing! I want to be able to feel comfortable and confident when I wear these tops in the warm weather on the island. The way you describe this product is so convincing that this product, will work for me as an intense body scrub treatment. Thank-you for doing this contest ren ren your so generous!